Designer Promotional Caps are widely used for promoting brands, products, causes, etc. Knowing the status of a Promotional Product, our Designer Promotional Caps are demanded by corporate companies in a large number. 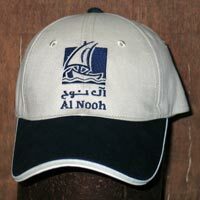 Apart from this, we also provide Promotional Printed Caps on which we engrave the logo or name of the company thereby making them a personal product of your company. Our Custom Promotional Caps are designed just according to the clientâ��s specifications, for which we are nominated as the reliable Promotional Caps Suppliers in India as well. Promotion black cap, code G111-A, head size 58cm. 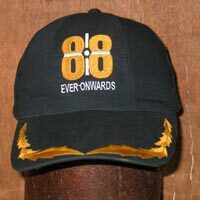 Itâ��s made from light brushed cotton twill fabric, there are 6 panels, One front of cap 88 logo in embroided text. The visor size 8cm with single beard embroidery. The cap is used the metal clasp with oval ring at back closure, so itâ��s easy to adjust the size as your desire. The sweatband is in black as top. Promotion Royal Blue / Grey cap, code G111-C, headsize 58cm. 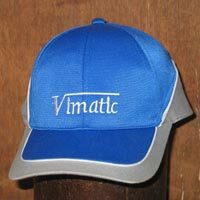 Itâ��s made from synthetic fabric, there are 6 panels with full piping of grey color cut, two front of cap Vimatic logo in embroided text. The visor size 7.5cm. Under visor is in Blue. It is has two color: Blue and Grey patch. Velcro back closure The sweatband is in black as top. Baseball cap is Faun/navy â�� code G111-D, head size 58cm. Itâ��s made from cotton twill fabric, it has 6 panels, every panel has one eyelet , one the top button matching main color. 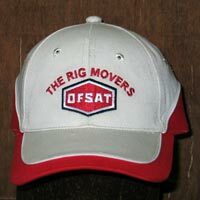 The front of cap is embroided logo text. The visor size 8cm with double white piping and sandwich of faun clor. The sweatband is the same color with the cap. Velcro clousure. Promotion Faun / Red cap, code G111-E, headsize 58cm. Itâ��s made from brushed cotton twill fabric, there are 6 panels with full piping of grey color cut, two front of cap OFSAT logo in embroided text. The visor size 7.5cm. Under visor is in Faun. It is has two color: Faun and red patch. Velcro back closure The sweatband is in faun as top. Promotion black cap, code G111-F, head size 58cm. 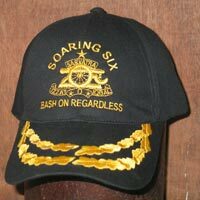 Itâ��s made from light brushed cotton twill fabric, there are 6 panels, Two front of cap has SOARING SIX logo in embroided text. The visor size 8cm with double beard embroidery. The cap has Velcro back closure. The sweatband is in black as top.